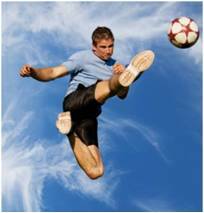 This research study (1) looked at a few factors in professional and elite soccer players. The researches examined these players for muscle imbalances between one leg muscle and it’s corresponding muscle on the opposite limb. They also looked at how many of these elite athletes had a history of leg injuries and how many still had lingering muscle imbalances in the legs. When first examining these 57 players, their muscle strength seemed normal regarding their amount of strength compared to their body weight. When examining them further looking specifically for muscle imbalances, 56% of the subjects had significant muscle strength imbalances. Regarding how many had a history of an injury, 63% had a history of a major lower limb injury. Of those with a history of injury, almost 2 out of 3 of them still had significant muscle imbalances. These findings are particularly interesting if we consider that soccer players tend to exercise a wider range of leg muscles in their sport than the average person or athletes of single direction sports such as running and bicycling. Pro and elite athletes also tend to have a greater likelihood of receiving advanced rehabilitation after injuries and preparations during training. Many teams have frequently scheduled testing programs for muscle strength to specifically look for imbalances as a way to maximize performance. If elite athletes in a multi-directional sport with advanced care and preparation have muscle imbalances at such high percentage rates, what are the prospects that you have muscle imbalances too? Previous Previous post: How do you assess individual muscle strength? Next Next post: Stretch? What to ask first!